‘Tele-Law’ through the Common Service Centre (CSC) network will connect the citizens to legal service providers with the help of technology enabled platforms. ‘Tele-Law’ will enable people to seek legal advice from lawyers through video conferencing available at the Common Service Centres (CSC). New Delhi: In its effort to make legal aid easily accessible to the marginalized communities and citizens living in rural areas, the Government of India has launched the ‘Tele-Law’. The Ministry of Law and Justice partnered with the Ministry of Electronics and Information Technology (MeitY), which anchors the Digital India programme, to provide legal aid services through its Common Service Centres (CSC) at the panchayat level, spread across the country. In the first phase, the ‘Tele-Law’ scheme will be tested as a pilot across 500 Common service Centres (CSC) in Uttar Pradesh and Bihar to understand the challenges and make necessary corrections to the scheme before it is scaled up and rolled out across the country in a phased manner. Under the scheme, a portal called ‘Tele-Law’ will be launched, which will be available across the Common Service Centre (CSC) network. This will connect the citizens to legal service providers with the help of technology enabled platforms. 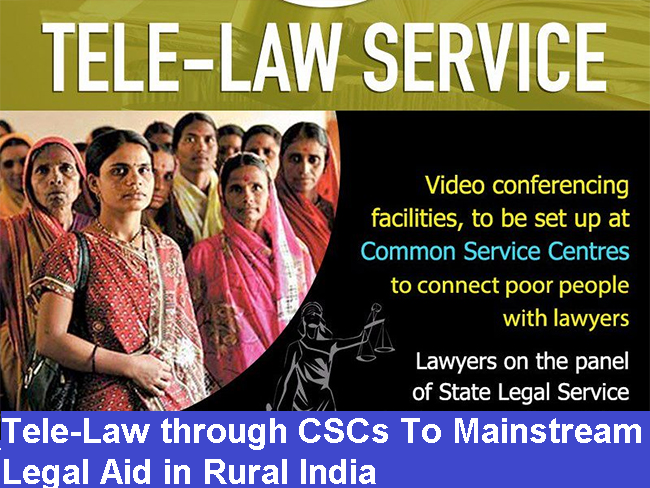 ‘Tele-Law’ will enable people to seek legal advice from lawyers through video conferencing available at the Common Service Centres (CSC). Additionally, law school clinics, District Legal Service Authorities, voluntary service providers and Non-Government Organisations working on legal aid and empowerment can also be connected through the CSCs anywhere and anytime, in order to strengthen access to justice for the marginalized communities. The National Legal Services Authority (NALSA) will provide a panel of lawyers from State capitals, who will be available through video conferencing to provide legal advice and counselling to the applicants, across the 1000 Common Service Centres (CSC). A robust monitoring and evaluation system is also being designed which will help in assessing the quality of legal advice provided and the ensuing benefit to those accessing it. 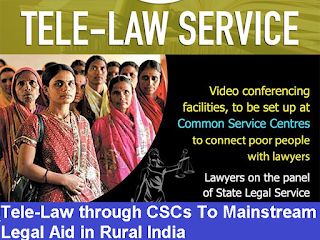 In addition to this, under this scheme, every Common Service Centre (CSC) will engage a Para Legal Volunteer (PLV), who will be the first point of contact for the rural citizens and will help them in understanding the legal issues, explain the advice given by lawyers and assist in further action required in cases as per the advice of the lawyer. Women PLVs will be encouraged and trained under the Scheme. One thousand women PLVs will work for mainstreaming legal aid services through the CSCs. The aim is to promote women entrepreneurship and empowerment and ensure women participation. The selected PLVs will also be provided with relevant training to fulfil their responsibilities effectively. A trained PLV will be available in a CSC for ten days in a month under the Scheme. These PLVs will help the applicant connect with a lawyer through the video conferencing facility at the CSC and will keep a track of the progress of the applicants’ cases and grievances and maintain a record. They will also submit the records maintained to the District Legal Service Authority every week. The National Legal Service Authority (NALSA) will provide a panel of lawyers who will be sitting in the State capitals and will be available through video conferencing to provide legal advice/counselling to the applicant at the CSCs. This scheme comes as a continuation to the Access to Justice Project for Marginalized Persons which is being implemented by Department of Justice and United Nation Development Programme (UNDP). The Access to Justice Project partnered with CSC-E-governance Services India Limited to mainstream legal literacy through common service centres in Jharkhand (10 CSCs in 3 districts) and then through 500 CSCs across 11 districts in Rajasthan. Under the program, 500 VLEs in Rajasthan were trained on social justice legislations such as fundamental rights, the right to information, citizen rights vis-à-vis policing, gender laws, child rights and labour laws.